Access your notes sketches and ideas from all your devices anytime with the Inkspace cloud service or export files directly to other preferred cloud services such as Dropbox®, Evernote® or OneNote®. The Wacom Inkspace app also supports exporting your work as JPG, PNG, PDF and WILL-file format. Get the essentials with a free Inkspace Basic* subscription: Bamboo Slate includes the free Inkspace Basic subscription, which gives you 5 GB storage (6,000+ pages of notes), the ability to sync content across all your smart devices, and access to your content on the Inkspace web portal. Unlock more features with a 3-month free subscription of Inkspace Plus*: All the features of Inkspace Basic, plus converting your handwritten notes to rich text, enhanced search features, export to scalable vector file format (SVG), and 50 GB (60,000+ pages of notes). * Access to Inkspace Basic and Inkspace Plus features requires creation of a Wacom ID. Image represents both sizes of Bamboo Slate available. Does not come with 2 quantity. Write naturally with pen on any paper, then store, shape and share your notes and ideas in the cloud. 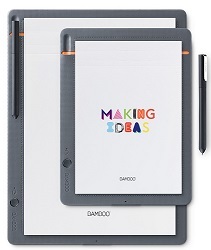 Take handwritten notes and ideas further with Bamboo Slate.